Get help with complicated claims your insurance company denied. Premier care, outstanding physicians, excellent medical outcomes & affordable costs, all at your fingertips with Soter Healthcare. This is just a short list of the available options for you. What can Soter do for me? Soter Healthcare brings you the resources you need, including the best in medical skill and science from around the world, to live the active, healthy life you want. From cutting edge regenerative medicine and microcurrent technology to ancient healing arts like acupuncture and massage, you get the care you need, individualized for your situation. In some cases, the medical care you need isn't where you live; in fact, it might be in another part of the world. Soter helps you do the research, find the doctors and hospitals with the best outcomes, and help make the arrangements, so that you can focus on the most important person needing attention: you. At Soter, we don't attempt to duplicate resources or replace your physicians at home. Our complementary services are designed to expand your range of options to make sure you recover and maintain your health. Soter Healthcare’s Health & Wellness Center is designed to help you and your family achieve and maintain optimum health. We help you remain active, relieve stress, and recover from injury or illness more quickly and without the need for drugs or surgery. If you're looking for alternatives, or have been told there's nothing that can be done, it's time to contact us. For centuries, people have found part of their medical care answers in what we know today as Destination Healthcare®. Simply put, Destination Healthcare® involves travel beyond your local community to get to where the care you need is located. For many people, Destination Healthcare® decisions have become so common they do not even think of them that way. When we drive past a local hospital to get to one we want to use, when we make an appointment with a doctor a little further away because we can get an appointment sooner, or when we travel to a specialist in another state, we’ve made a destination healthcare decision. What is new is that increasingly, people are finding access to the quality care they want at more affordable prices by using premier doctors and hospitals. By leveraging our relationships throughout the world, we deliver what consumers, insurance carriers, doctors, and hospitals cannot: improved outcomes achieved while bending the healthcare cost curve downward. Our unique approach to destination medical care gets you what you need, immediate access to the best possible care at costs you can afford and your insurance company will approve. Chuck and Gina Norris with Drs. Wang and Du at TEDA Puhua International Hospital. 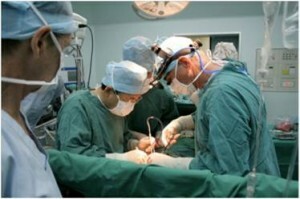 Dr. Bruce Reitz assists Dr. Liu Xiaocheng during surgery at the TEDA International Cardiovascular Hospital. Dr. Reitz served as Chief of Cardiac Surgery at Johns Hopkins University before becoming Chairman of the Department of Cardiothoracic Surgery at Stanford and is universally recognized as one of the world’s foremost cardiac surgeons.